Great ideal, And good looking. I seen one made from square steel tubing and small "C" channel iron and welded together. Your 1/2" coupling is from the oil/gas fields and not the standard type find in hardware stores. One of my favorites, a rail gon-esque build. This can be readily swapped out with Lego truck assemblies to go back and forth between formats. Working on a little PRR lowside tender from a 265 waffle tender. 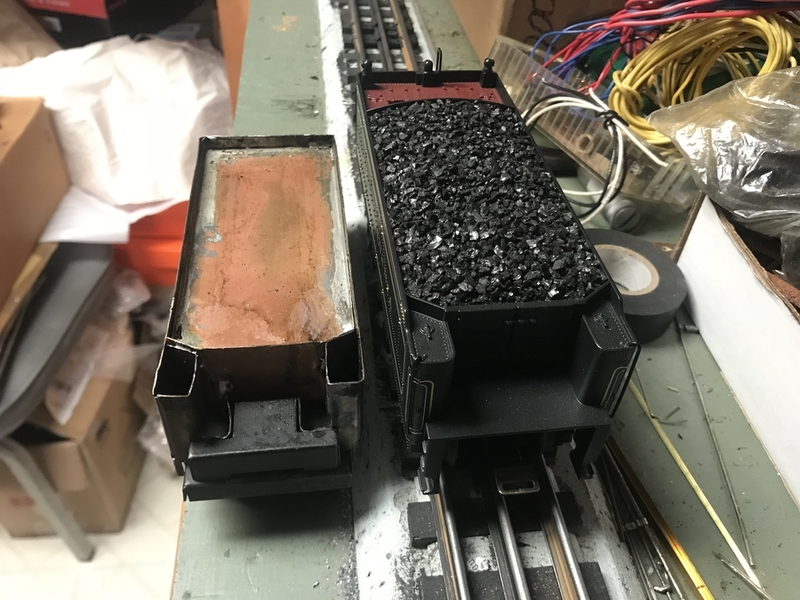 These are my scratch-built ingot buggies (flatcars). 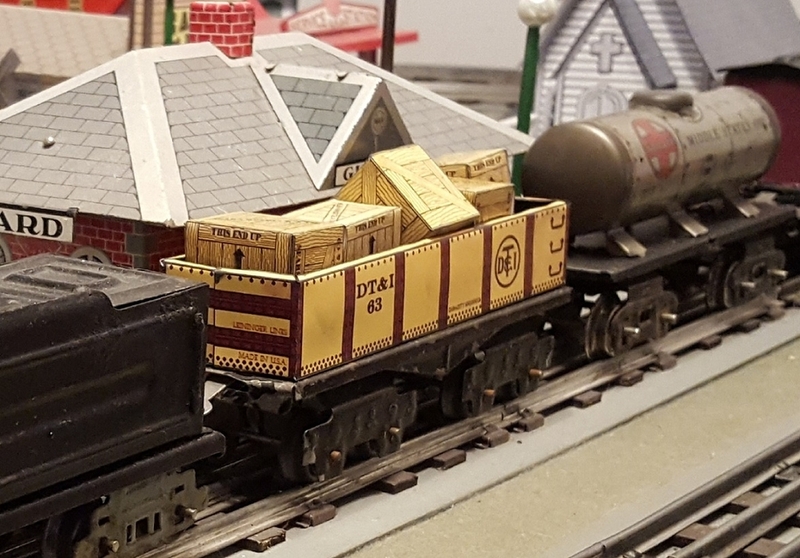 This one is hauling my scratch-built ingot molds. Hot! I made these 3 excursion cars from die cast Lionel post war flat cars. After reading about Cass then going there just had to have them. This is about as crazy as I get! Canadian National Hudson tank engine, commuter service to Montreal. I had to have one first time I saw a picture of one! My homemade track cleaning car. I have sent the plans, photos, and drawing to over 300 OGR Forum members. Several of you train men really have some imagination and building skills. Great jobs, especially the prior four posts. And a super job documenting and photoing your projects. Your efforts shame my attempts to copy Lionel and others rolling stock. Not really Charlie. Not at all. It's a different style of build. I respect "modelers" and "builders" both for what they do to achieve a goal. (inculde yourself in both catagories please). A little better supplies is all you lacked imo. The end result is more than inspiring; it's empowering. (I'm not making it up, and the guy designed for Caddy, Ford, and Tesla so far; which is fine by keyboard..... but hide the tools from him eh? So true I work with several engineers that couldn’t figure out righty tighty lefty loosey. It’s a piece of paper that anyone can get if they pass a test and pay some money. You want to have some fun, start asking about the differences between MET’s and ME’s.... that can be a fun one.... l’ll stop before I get into trouble. It takes all types and everything in this thread is creative and neat. Grace and detail usually come with experience, so the more you do, the better you get for the most part. 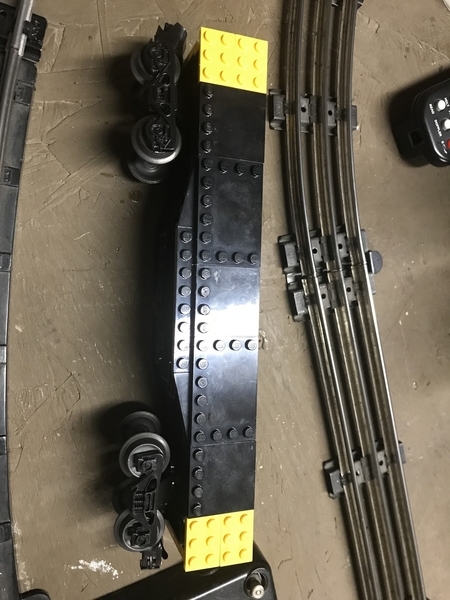 When my grandnephews were in their "lego phase", I added a lego baseboard to a few flatcars. They could then customize a train with lego parts to build different types of cars... and whatever! 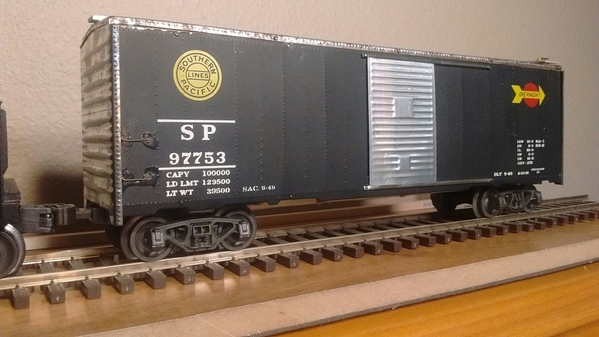 I bought a Reynolds Metal covered hopper car without the 12 roof hatch covers. I made a more modern, easy to use center fill cover for the car. The older 12 hatch covers require a special loading bridge with 12 filling spouts and require the opening, closing and applying a security metal seals on each of the 12 hatch covers. The center fill uses 3 or so loading spouts into the center of the car and has a four part center car long cover. The covers overlap each other and require only opening and closing four covers and only one security seal saving time and money. Eddiem, that Lego flatcar idea is brilliant! 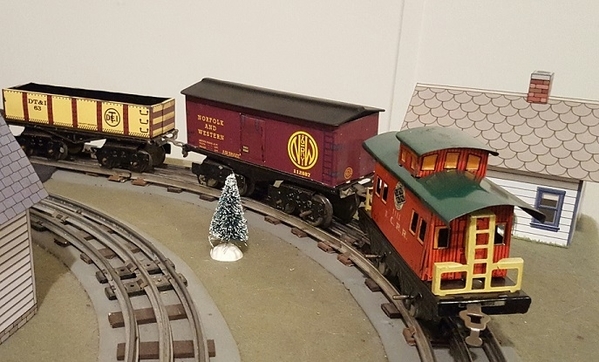 Here are my Great Northern woodchip cars. MTH electric trains makes a smooth side woodchip car. They do not make one in the Great Northern Road name. None of these woodchip cars have ribs steel supports on the sides as the ones do in real life. I had to completely redo the car. 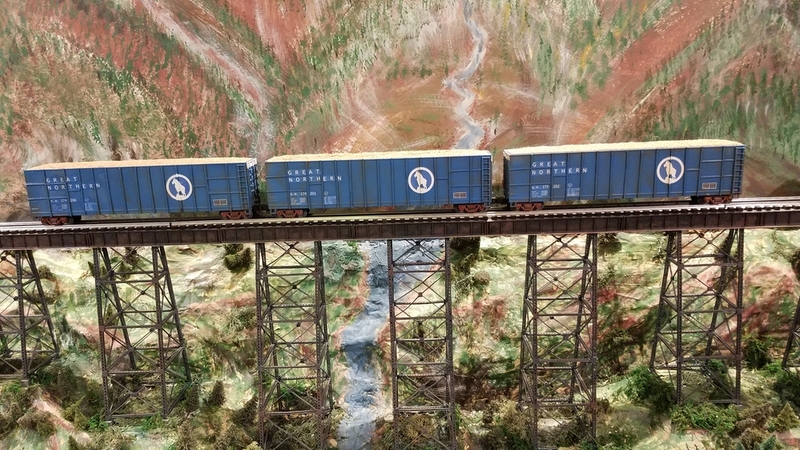 It is a custom paint job with the correct big sky blue paint I am a member of the Great Northern Railway historical society and have color chips. The decals were also completely custom made. The only thing that is original about this car or the trucks the couplers and the square box belongs to MTH. Everything else is mine. Check out my Youtube Channel and Facebook Page! 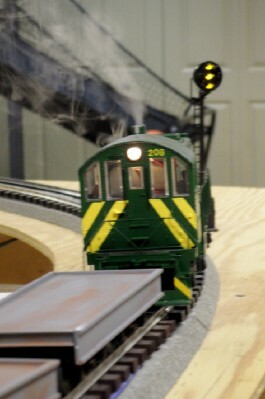 Schylling Rail Zeppelin powered by a Lionel motor. Ivor the Engine created out of Lionel's Percy. Ivor is from a BBC TV show of old. Idris the dragon is poking out and he has a whistle from a steam calliope. I made a homemade Chicken Dispatch car. 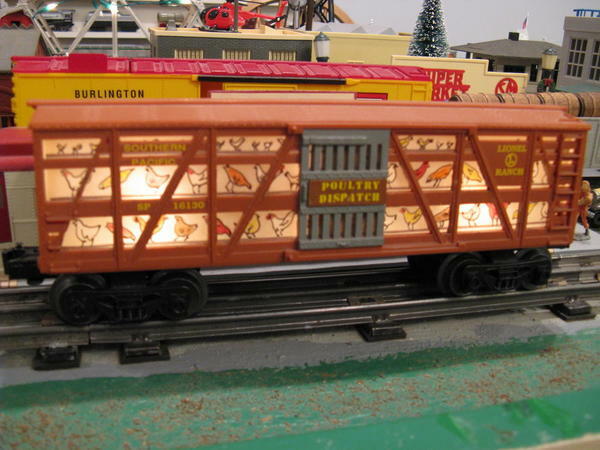 A Lionel small stock car was used to make the Chicken Dispatch car. Every other slat was cut out of the side boards and parchment paper was used to Sharpie paint the chickens on. Lights were added to the roof and a pickup made. No chicken poop sweeping man though ! 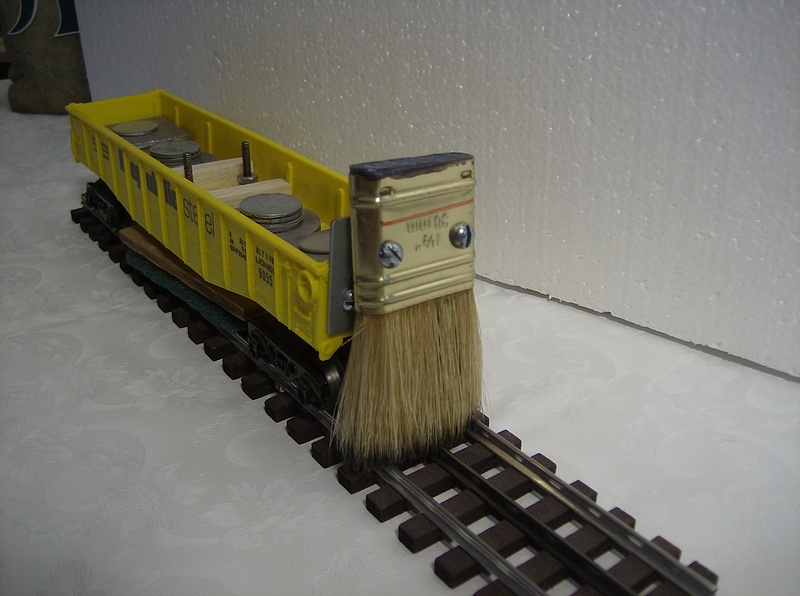 I later bought a Lionel Chicken Dispatch car with the sweeping man but I enjoyed making this car. 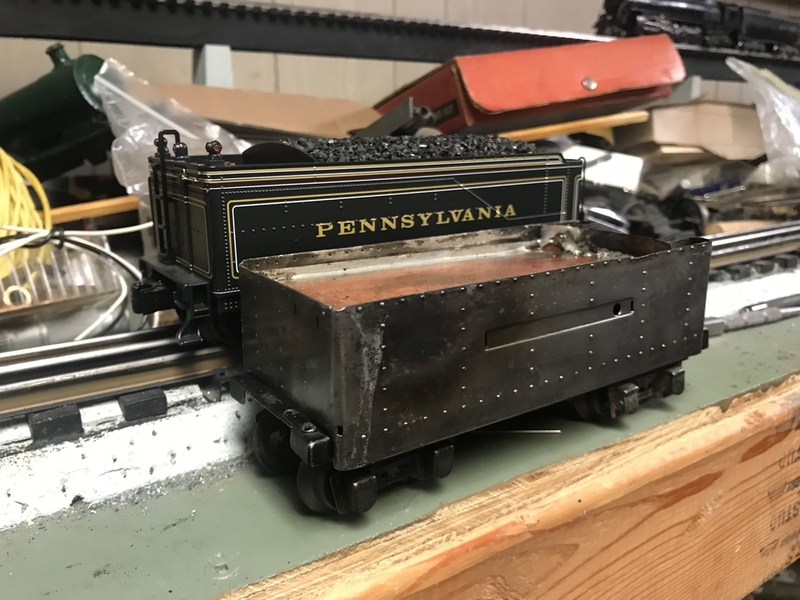 Homemade power pick ups were made for all homemade lighted cars from brass shim stock and Lionel plastic sided trucks. Pickup detail. A piece of tin can was added to improve durability of shim stock. Lionel made a submarine that really floated and submerged and a rail car to carry it. I found two toy submarines that may work but I have never tried them. I did make mounts for the submarines on two rail cars and have a new different car from most of mine. 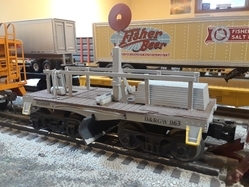 K-Line flat car with scale wheel sets. 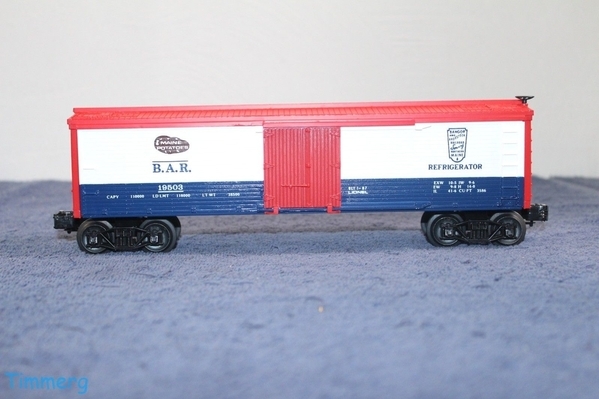 K-Line flat car with shortened Lionel caboose and booms from a BB-157 tow truck. This car started life as a K-Line search light car Number USA 401098 without the search light and operator. I added a mini Christmas tree flasher light bulb and socket, light for the new operator and control panel and a red plastic "thing a ma jig" red flashing light cover. The car now enjoys live as an Atomic Generator Car. Every train layout needs a portable power source for emergencies. I love the manger car. My wife collects mangers and I hope to borrow one and make a manger car. Thanks for the inspiration. I would add it to my secular reindeer and Santa Christmas train. I modified a Marx work caboose by adding a flood light to allow night operation to be performed more safely. I added a homemade light pick-up to power the light. Nice, clean and professional job. I made a ballast hauling gondola car load and placed a small back hoe machine on top to add to my track maintenance train. The ballast load was made from a piece of Styrofoam (to keep it light weight) with ballast glued on with Elmer's glue. Keep your homemade cars coming in. 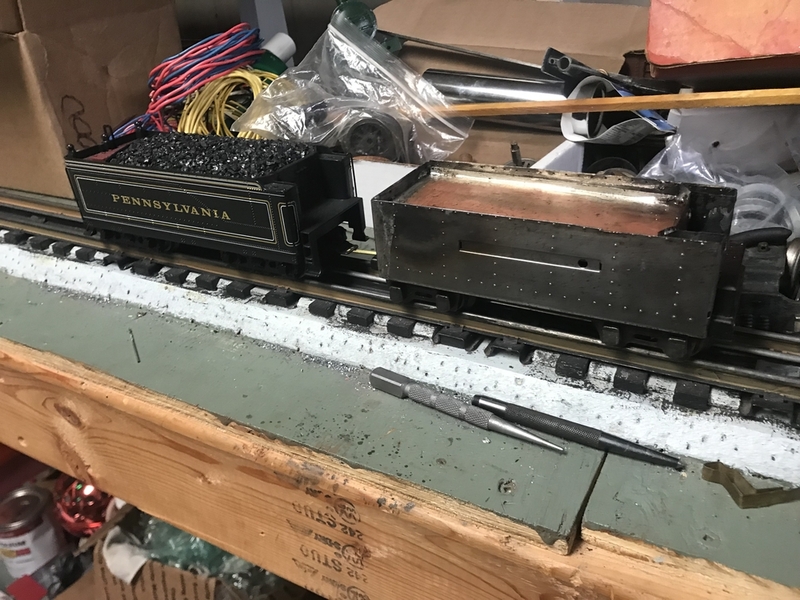 "Prewar cast iron" loco made from an old Marx 999 with styrene and copper parts. Caboose is a real prewar Flyer item. 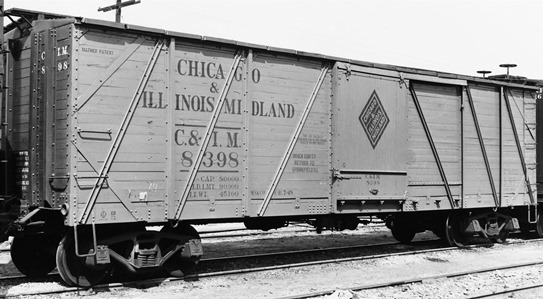 Gondola and boxcar graphics were drawn on the computer and printed on photo paper. Gondola body is cardstock with the photo paper glued to it. Beaver-tail observation made from AF prewar coach. The "real" Nike Swoosh Darned like button never works on this thread; which is a shame because everyone deserves two. Bob, the rocket car looks great! Nothing as awesome as what you guys have done; I guess I'll need some stock to run on 3 rail track to go behind my new loco. Still have to add details, but it's a start. Disclaimer: I am not responsible for the crappy glue job on those grab irons; this car came to me this way, I swear! 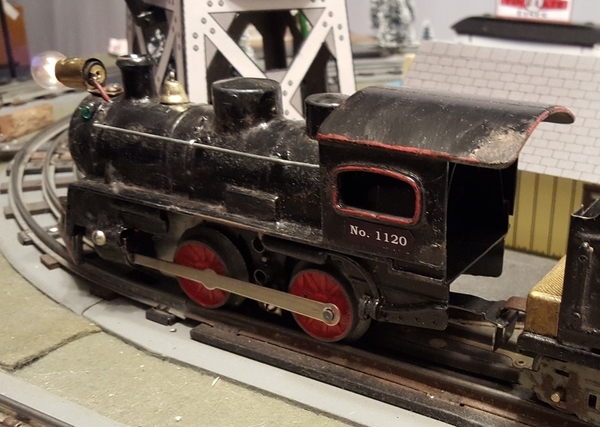 Years ago I purchased a Lionel 2025 2-6-4 steam locomotive that came with a homemade enclosed cab and white wall painted wheels. I left both intact. The Lionel 2025 and 2035 are my favorite engines to run on my layout. 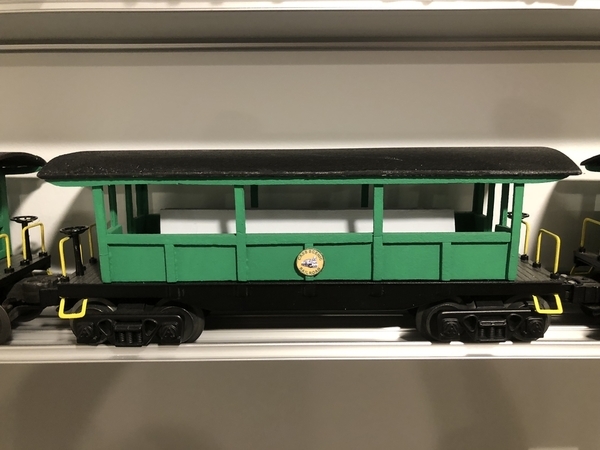 Recently I was reviewing a March 1999 Classic Toy Trains magazine and read a product review of a 3rd Rail Brass O gauge Southern Pacific Cab-forward 4-8-8-2 steam locomotive. I was not familiar with cab-forward engines. The article pointed out cab-forward steam locomotives were made to solve a life and death problem Southern Pacific had due to asphyxiation of crew when operating in long tunnels and snows sheds in the Sierra Mountains in the early 1900s. Baldwin developed the cab-forward style locomotive and over 195 engines were made from 1920 and used into the 1950s. Since I already, more or less, had a enclosed cabin steam locomotive, the Lionel 2025 mentioned above, all I would have to do to make a cab forward locomotive is find oil tender (an oil tender must be used as there is no way to get coal from a coal tender to the fire box with the cab in the front of the train). Next was to make a hookup connector from the front of my 2025 steamer to the front of the oil tender at the tender slot coupling. 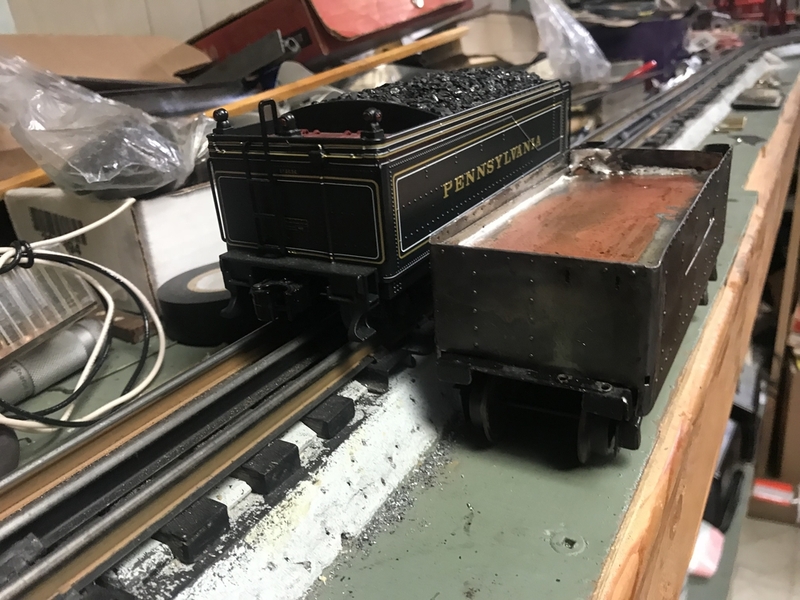 I know a Lionel 2025 2-6-4 is not a 4-8-8-2 which would have no chance of running on my O27 track ! I found a metal case from a junk DVD player as a source of sheet metal for the connector. This metal sheet is thicker than tin can, strong enough for the connector and can be cut easily with a pair of tin snips. I attached a coupler to the front of a General's pilot truck after figuring out with a body mount, the front overhang pulled cars right off the rails in curves, or if heavier, the cars dragged the drivers off. 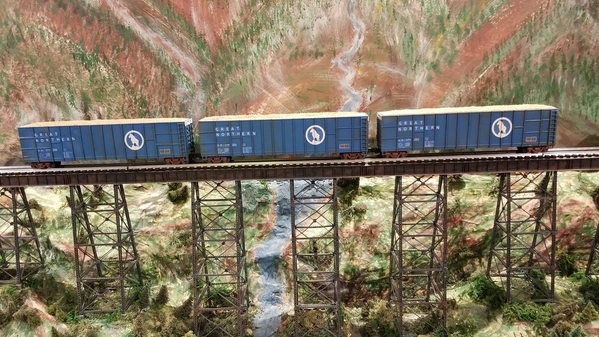 I imagine fast angle wheels wouldn't do as well; the flat tread and deep flanges of early and loco wheels do a great job keeping the pilot truck on the rails, though you'd likely think "not". I think it's that the center of gravity and attachment point is so low; nearly at pilot truck axle height. 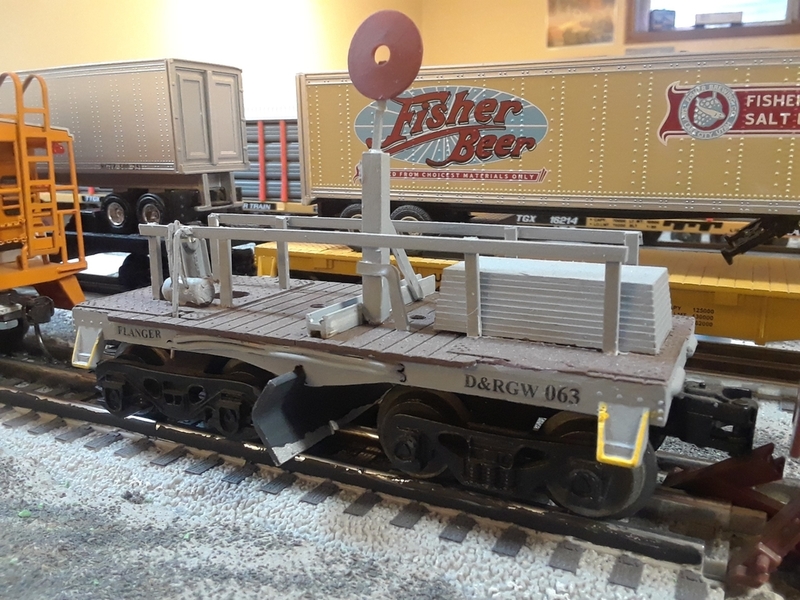 Here is a homemade General Motors EMD Train Generator hauling car. I figured this electric motor would be about the scale size of the diesel driven generators used on F3 EMD diesel locos. I may be wrong but it works on my layout! It fits well on a depressed flat car. Great job on making the Lionel woodsided reefer into an outside braced boxcar. I was unaware of that class of car and its rarity in being modeled. Not having or not finding or not being made one are some of the best motivations for homemaking a car allowing one to have the fun and experience at doing for yourself. 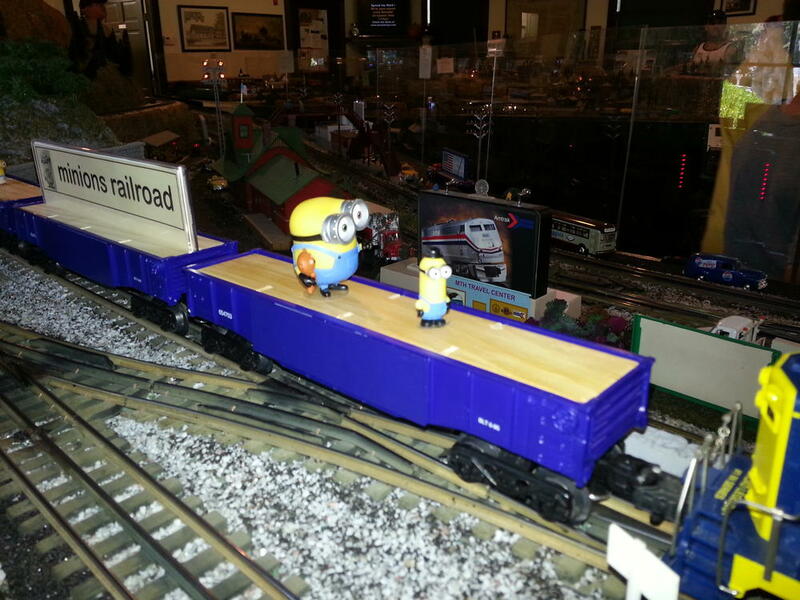 Very nice work on your C&IM outside braced boxcar, and thank you for posting the pictures, too!